Seraphim premium WordPress theme is an extremely unique template with a clean content design. 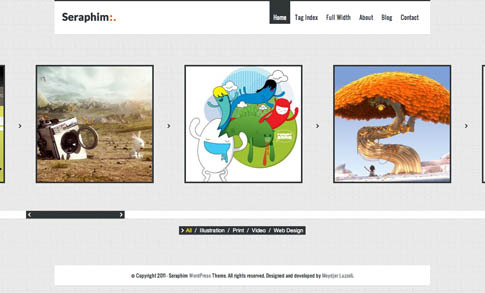 Seraphim is extremely fresh, creative, smart, and is the perfect way to show off your portfolio! With a great to-the-point options panel, you can easily build your online showcase in few minutes minutes, presenting your work in a cool way and giving welcome with a cool animated intro. Make sure to check out Seraphim premium theme’s awesome features in person by trying out the live demo at the end of the post! Come back and check out the showcase as we find more sites from around the web using Seraphim.